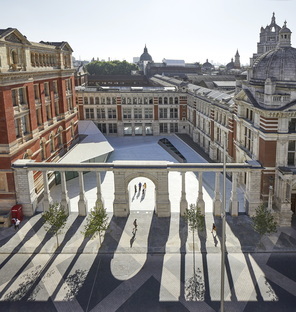 Amanda Levete from AL_A is behind the largest architectural project for the Victoria and Albert Museum in London in 100+ years with the new Exhibition Road Quarter. An approach that opens the museum to the street and adds a new entrance to give the museum a new relationship with the urban context. 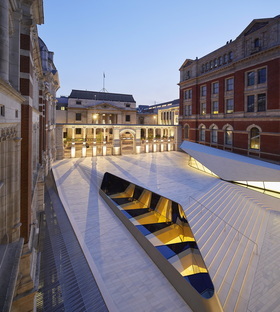 AL_A - the UK architecture studio founded in 2009 by RIBA Stirling Prize-winner Amanda Levete- has designed the new Exhibition Road Quarter of the Victoria and Albert Museum in London. The architect's work also includes the Museum of Art, Architecture and Technology MAAT in Lisbon (link) and here she is part of the V&A's major project to add new galleries and boost engagement with both the general public and with the other institutions on Exhibition Road, in the cultural district of South Kensington. To achieve this ambitious goal, Amanda Levete proposed a concept that is as cultural as it is urban: the courtyard of the old Boiler House has been designed to give the museum a new connection and new entry from Exhibition Road. The AL_A design team set the public courtyard behind the Aston Webb Screen, a colonnade erected in 1909 to hide the museum's boiler rooms, and it is porcelain-tiled to respond specifically to the V&A's numerous examples of decorative ceramics. It also hides a 6400-square metre underground gallery. The end result is a large entrance that belongs to both the museum and the street, that transitions from a cultural space to an urban space to connect and interact even more with the general public. The Exhibition Road Quarter opened after six years of work, at the same time as REVEAL, a festival that is running until 7 July 2017. A series of art and design commissions and performances dedicated to this architectural intervention explore the heritage, modernity and technology of the Victoria and Albert to celebrate the museum's next 100 years, together with the other institutions in South Kensington.